We could use your help to educate others! Come volunteer with us as we set up education booths across the state at a variety of festivals and fairs. 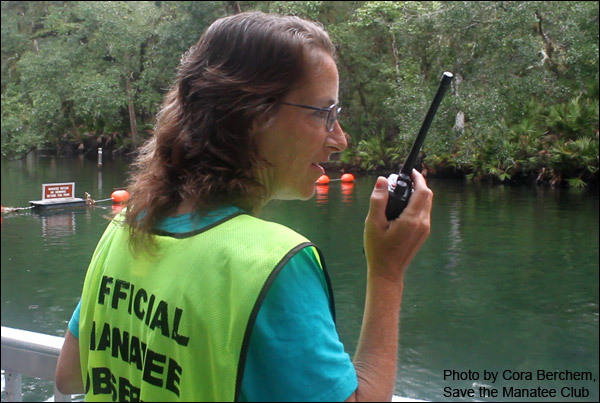 If you’re passionate about manatees and have some time to spare, fill out our Online Volunteer Application (see link on this page). 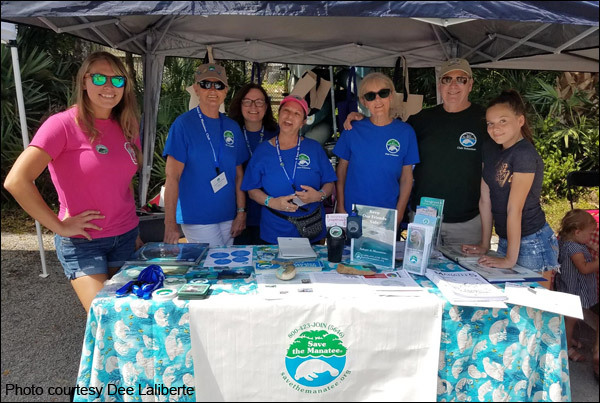 Volunteers at the SMC table on April 6th 2019 for Turtle Day at Ponce Inlet. Thank you to Barbara Stewart, Janneke Bogyo, Laura Frenchik, Dee Laliberte, Janice and Terry Nearing, and (not pictured) Trinket Mason! You can help Save the Manatee Club by becoming a Club volunteer. SMC volunteers staff tables at manatee-related events, engage in speaking presentations, help out in the SMC offices, write letters and send e-mails on issues of concern to manatees, and report information to manatee researchers. You can make a difference for manatees! If you are interested in volunteering, please fill out our Online Volunteer Application. For those wishing to inquire about earning community service hours at the Club’s office in Maitland, Florida, please do not fill out the Online Volunteer Application form. 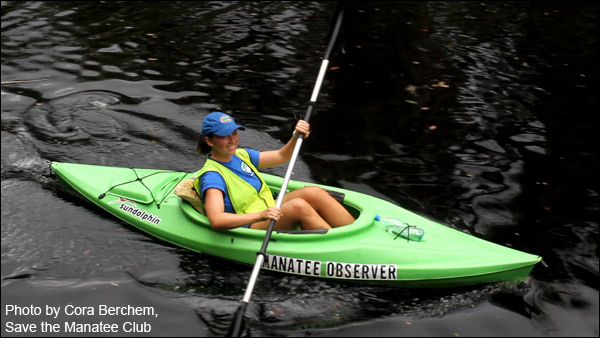 For eligibility and availability, contact Diana Ngai, the Club’s Volunteer Activities Coordinator, at dngai@savethemanatee.org or call 407-539-0990. 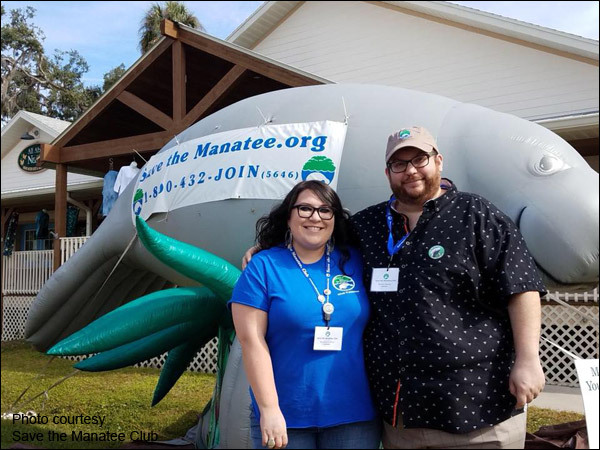 Stephanie D’Amico and her husband Stephen pose in front of manatee “Hope” at the Florida Manatee Festival in Crystal River, a volunteer favorite. 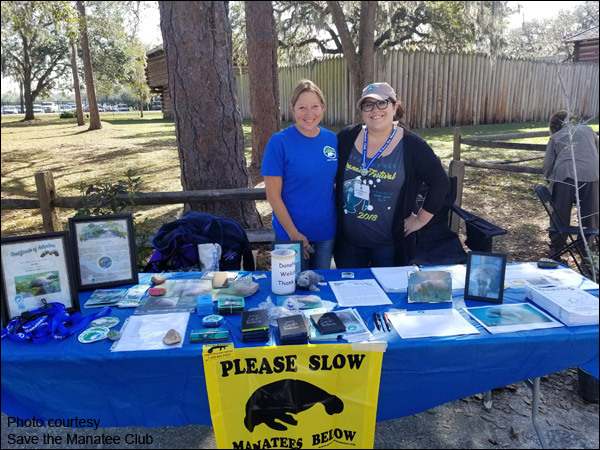 Stephanie D’Amico has been a volunteer with Save the Manatee Club (SMC) since 2017. She has lived in Michigan, New York, Washington D.C., and Vermont but calls Orlando, Florida home now. Stephanie D’Amico (at right) and fellow volunteer Sue Martin (at left) at the Wetlands Festival in Fort Christmas, FL, educating the visitors about manatees. Stephanie especially enjoys volunteering at SMC tabling events. “I love talking to young kids who want to tell me about the first manatee they saw or want to get into science to save the manatees. It’s incredibly rewarding!” Even after a long day of talking about manatees, Stephanie and her husband Stephen (who is also an SMC volunteer) enjoy walks and manatee watching at Blue Spring State Park with their rescue dog Clementine. Stephanie is always willing to lend a hand to her fellow volunteers and is a source of positive energy for all. 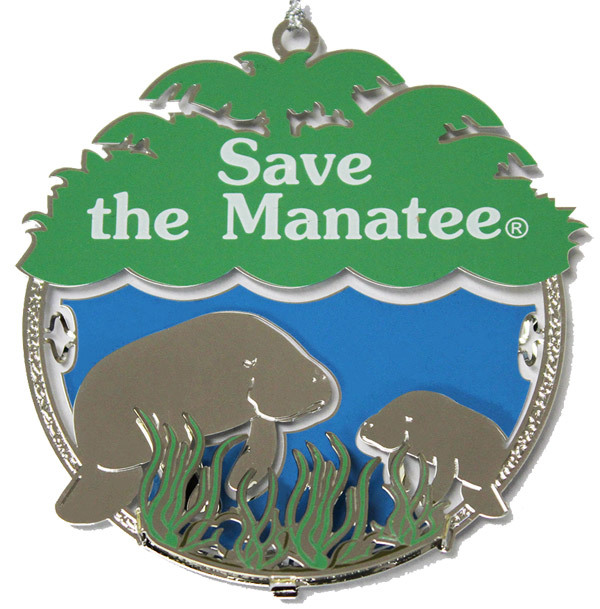 In appreciation for Stephanie D’Amico’s volunteer work, the Club presents her with this special Save the Manatee Club metal ornament in recognition as a “Volunteer of the Month” recipient. 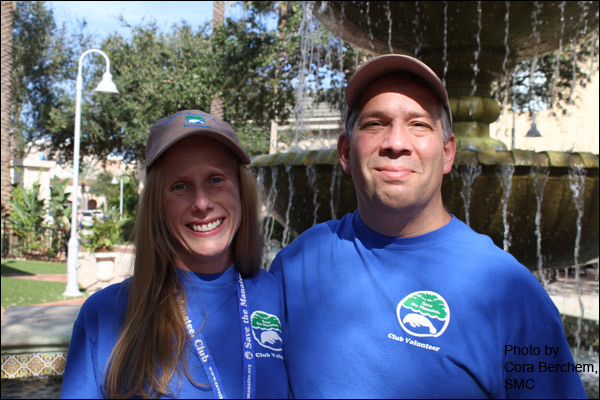 Melissa and Mike Fishman from Rockledge in Brevard County, Florida wear their volunteer T-shirts and caps whenever they table at events for Save the Manatee Club. Join our volunteer team and earn points through the Volunteer Rewards Program to get your free shirt and cap. Earn It, Pin It, Show It! Barbara Manatee wears her volunteer name tag on a lanyard studded with the Club’s recognition pins. Save the Manatee Club presents a variety of service pins to further recognize and honor the efforts and importance of our loyal volunteer/members. The special, customized pins are earned by registered volunteers who staff education tables for the Club at events, help out in our Maitland office, or give manatee presentations for the Club at local schools, libraries, etc. Wear the pins on the Club’s lanyard which holds the volunteer name tag, or on the Club’s volunteer cap or t-shirt. Save the Manatee Club is partnering with Central Florida RECON. As always, we will have at least 6 kayaks available to use as well as cleanup equipment. Volunteers on foot are always welcome here as well. *Please bring a hat and water for this event and note that there are no bathroom facilities at the launch site. Save the Manatee Club is partnering with Central Florida RECON. As usual, we will have at least 6 kayaks available to use for the event. To reserve a spot please visit the Facebook event page at https://www.facebook.com/events/867757450236178/ and drop a comment below. We will also have cleanup equipment available to borrow for the event including buckets, pickers, and gloves.